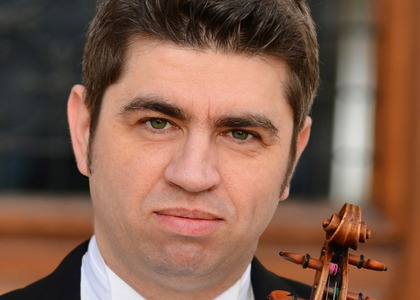 The international violinist Remus Azoitei - a first-class musician - in a concert with the National Radio Orchestra on Friday 5th of April (19:00) at Sala Radio. Remus Azoitei, who plays a world heritage Gagliano violin made in 1740, was the first ever to record the entirety of Enescu's works for violin and piano (with the pianist Eduard Stan), published under the Hanssler record label (Germany). In 2001, he was appointed violin professor at the Royal Academy of Music in London, at the time becoming the youngest ever violin professor in the 200 year history of the institution. In 2005, he performed Bach's Double concerto with violinist Nigel Kennedy, at the Enescu Festival, a concert that was broadcast on 19 radio stations and televisions in Europe. Remus Azoitei will perform the Concerto in D Major for Violin and Orchestra by Beethoven, under the baton of the Slovak conductor PETER FERANEC, the first foreigner to serve as the principal conductor of the famous Bolşoi Theatre in Moscow. In the second part of the evening, Azoitei will perform Petrushka - a ballet in 4 acts by the Russian composer Igor Stravinki. The ballet was first performed by the celebrated dance troupe Ballets Russes in their Paris season, at the beginning of the 20th century. The premiere took place in 1911, at Théâtre du Châtelet, with legendary ballet dancers Vaslav Nijinsky and Tamara Karsavina portraying the main roles.